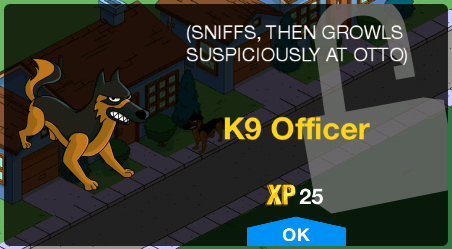 The Simpsons: Tapped Out received an in-game update today which adds level 33 along with other new characters, buildings, decorations and enhancements. If you have been following our blog, the features seem consistent with the level 33 spoiler we posted a couple of weeks ago. The update is installed automatically when you start the game. 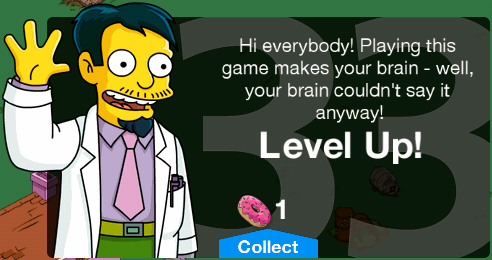 Lets take a look at all the new features which you will receive with the Level 33 update of The Simpsons Tapped Out. 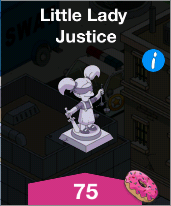 If you have already completed level 32, you will be awarded 1 doughnut for reaching level 33. 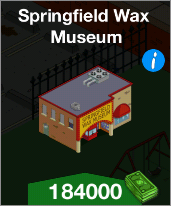 Springfield Wax Museum ( 276000) *discounted to 184000 with level 34. The building will take 24 hours to complete once purchased and placed. You will be awarded an additional 100 and 10 for completion. 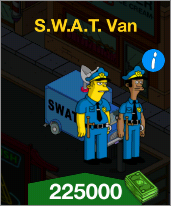 Placing the van will also unlock Lou and Eddie who will join your Springfield community. 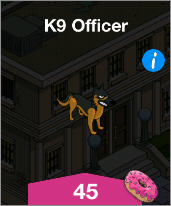 You could also consider purchasing the K9 Office for 45 which will unlock him and allow him to roam around Springfield. Bad Cops Pt. 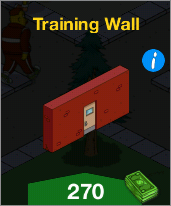 3 - Chief Wiggum decides to get his team prepared and you will be required to place the training wall ( 270). He also wants Eddie to train for action which will take Eddie 12 hours ( 420 100). You will be awarded an additional 100 and 10 for completion. Bad Cops Pt. 4 - Wiggum is unhappy that Mayor Quimby wants to "catch the criminals" knowing that this will be more work for him. Lou suggests that they go over some old cases and make some actual arrests. Chief Wiggum leaves Lou to study the evidence, while he heads over to the Krusty Burger with Eddie for milkshakes. Click on Eddie to continue. Eddie says that local farmers have complained that Cletus is brewing moonshine. 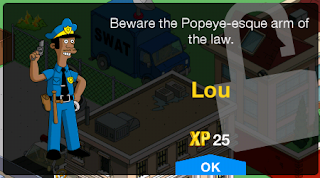 Chief Wiggum doesnt want to bother with following up, but Lou convinces him. Bad Cops Pt. 5 - Make Cletus go in for questioning. 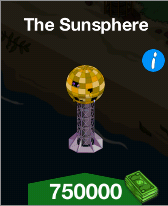 The task takes 8 hours ( 275 70) and you will be awarded an additional 100 and 10 for completion. Code Brown - Homer cant watch Netflix because the Wi-Fi he steals from Ned Flanders isnt working anymore. Marge wants him to go and check up on Bart instead. Usual Suspects Pt. 1 - Eddie has some questions for Homer about some recent felonies in the brown house. 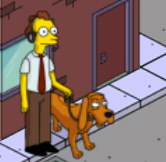 Make Homer go in for questioning for 8 hours ( 275 70). You will be awarded an additional 100 and 10 for completion. Usual Suspects Pt. 2 - Eddie and Lou follow the Chief's instructions to combat crime in Springfield. Usual Suspects Pt. 3 - Kent is reporting about the sudden dramatic surge in police activity in Springfield and interviews a tired Chief Wiggum. 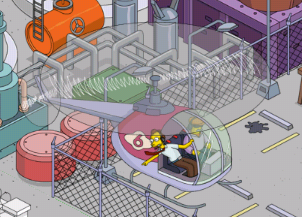 Wiggum decides to nap in the S.W.A.T. van for 6 hours ( 225 55). You will be awarded an additional 100 and 10 for completion. Moe Town - Make Moe spy on Midge (Marge) for 12 hours ( 420 100). You will be awarded an additional 100 and 10 for completion. Usual Suspects Pt. 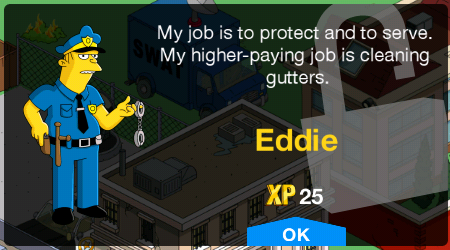 4 - Wiggum wants Eddie to search Snake. Snake slips away with an excuse about being a legitimate insurance policy salesman. You have to make Snake con money from old people at the Springfield retirement castle for 8 hours. ( 275 70) You will be awarded an additional 100 and 10 for completion. Usual Suspects Pt. 5 - Make Lou interview suspects for 12 hours ( 420 100). You will be awarded an additional 100 and 10 for completion. Springfield Confidential Pt. 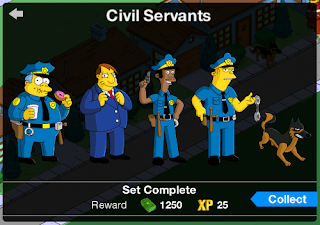 1 - Tony congratulates Chief Wiggum on his exemplary work in keeping petty crimes in check. Since the police department is focussed on the smaller crimes, Tony is content getting on with 'business'. 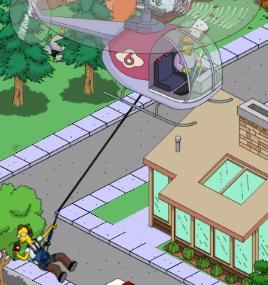 Not All Donuts Are Currency - Make Wiggum go on a stake out for 24 hours ( 600 150) You will be awarded an additional 100 and 10 for completion. Crackdown Pt. 2 - Make 20 Springfield criminals serve time for their crimes. Each criminal has to serve time for 24 hours ( 600 150). Chief Wiggum ends up locking himself inside accidentally alongside most of the known Springfield residents. You will be awarded an additional 100 and 10 for completion. 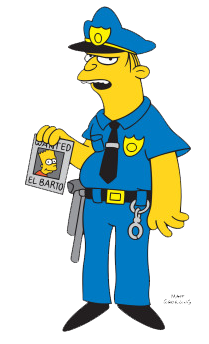 Wiggum congratulates his team for more arrests this weeks than in the entire history of the S.P.D. Eddie suggests that they go after Fat Tony, but Wiggum is intimidated by the thought. He suggests that they round up a list of repeat offenders from the Springfield school system instead. Crackdown Pt. 3 - Make (six) youth serve time for 24 hours ( 600 150 each). Ralph, Lisa, Bart, Martin, Nelson and Milhouse make the list. You will be awarded an additional 100 and 10 for completion. Crackdown Pt. 4 - Kent reports that abuse of police power has reached epidemic proportions. 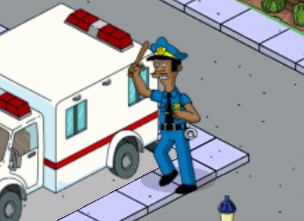 Chief Wiggum makes Brockman go in for questioning for 8 hours ( 275 70) You will be awarded an additional 100 and 10 for completion. Crackdown Pt. 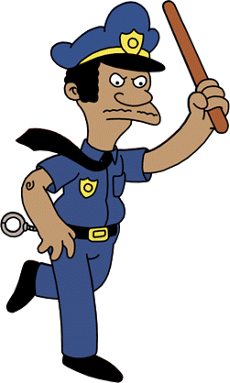 5 - Wiggum realizes it wasn't a good idea to arrest kids and put them in prison. Springfield Confidential Pt. 2 - Quimby is concerned that Fat Tony is having trouble conducting his 'business'. Tony admits that he is only having difficulty getting attendees at the racetrack. Quimby promises that he will get the police to release potential race track attendees. Springfield Confidential Pt. 3 - Tony is happy the police are distracted by petty crimes while he and his gang continue to run things their way. 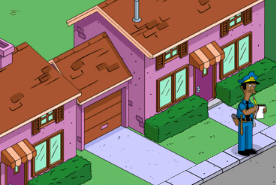 Make Fat Tony collect construction kickbacks ( 275 70). The task takes 8 hours to complete. Make Legs sell smuggled goods ( 275 70). The task takes 8 hours to complete. Make Louie collect Tribute ( 420 100). The task takes 12 hours to complete. Make Lou investigate corruption ( 420 100). The task takes 12 hours to complete. Make Eddie investigate corruption ( 420 100). The task takes 12 hours to complete. Lou tells Mayor Quimby that the police has evidence linking him you a known organized crime syndicate in Springfield and that he is under arrest. Springfield Confidential Pt. 5 - Make Quimby serve time for 24 hours ( 600 150). You will be awarded an additional 100 and 10 for completion. Springfield Confidential Pt. 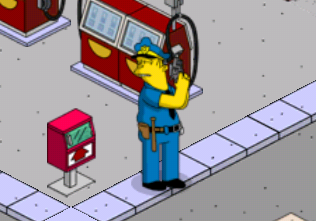 6 - Wiggum is finally after Fat Tony and he wants to charge him for tax evasion. Springfield Confidential Pt. 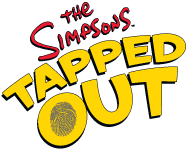 7 - Lisa is happy that the organized crime ring in Springfield has been put behind bars. After arguing with Bart for some time, she proceeds to do next week's homework. The task takes 24 hours to complete ( 600 150) and you will be awarded an additional 100 and 10 for completion. 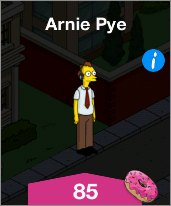 Arnie Pye is a premium character released with level 33 on The Simpsons Tapped Out and costs 85 to purchase. Once you purchase him you will be awarded 25. 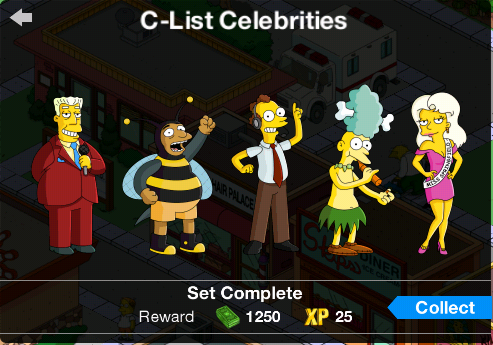 You will also be awarded an additional 1250 and 25 for completing the C-List Celebrities set. 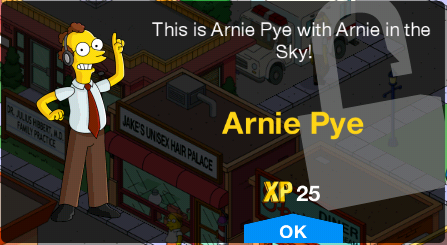 Arnie Pye In the Sky Pt. 1 - Make Arnie Pye do a traffic report for 12 hours ( 600 150) You will be awarded an additional 100 and 10 for completion. Arnie Pye In the Sky Pt. 2 - Make Arnie Pye walk Newshound (The Channel 6 mascot) for 8 hours ( 420 105). You will be awarded an additional 100 and 10 for completion. Arnie Pye In the Sky Pt. 3 - Make Arnie Pye do a sky harness Interview for 60 minutes. ( 105 26). You will be awarded an additional 100 and 10 for completion. Kent is unhappy that Arnie Pye has made his way to the anchor chair in Channel 6. Arnie Pye In the Sky Pt. 5 - Make Arnie Pye take over as News Anchor for 4 hours ( 260 70). You will be awarded an additional 100 and 10 for completion. What is the Krust-O-Meter ?